Not all Neo Geo games are created equal. Although the majority of titles on SNK’s system offer great blasts of arcade goodness, there were also a number of Neo Geo games back in the day that didn’t quite meet the high standards set by other gems like The King Of Fighters or Metal Slug. Puzzled, sadly, is a perfect example of this. Its plot is unique, at least. There’s a village full of men and a village full of women, and they used to always be at war until the gods decided “time to pack this in” and built a ruddy big wall separating them. The villages are now bored of this set-up, so they each send a representative – a young lad and a young lass – up in hot air balloons in the hope that they’ll meet each other at the top and try to convince the gods together that the wall should be torn down. An original story, then, but if the resulting game looks like Tetris, that’s because it is. Well, sort of. The basic gist is the same: you have seven different Tetrominos dropping from the sky at random and if you can form a complete line with them, that line will disappear. You know this, you don’t need to have it explained to you. The difference, however, is the presence of the aforementioned hot air balloon. You see, the game’s made up of 50 stages and at the bottom of each stage is a balloon – either a round pink one or one with a face drawn on it, depending on whether you chose to play as the boy or the girl. 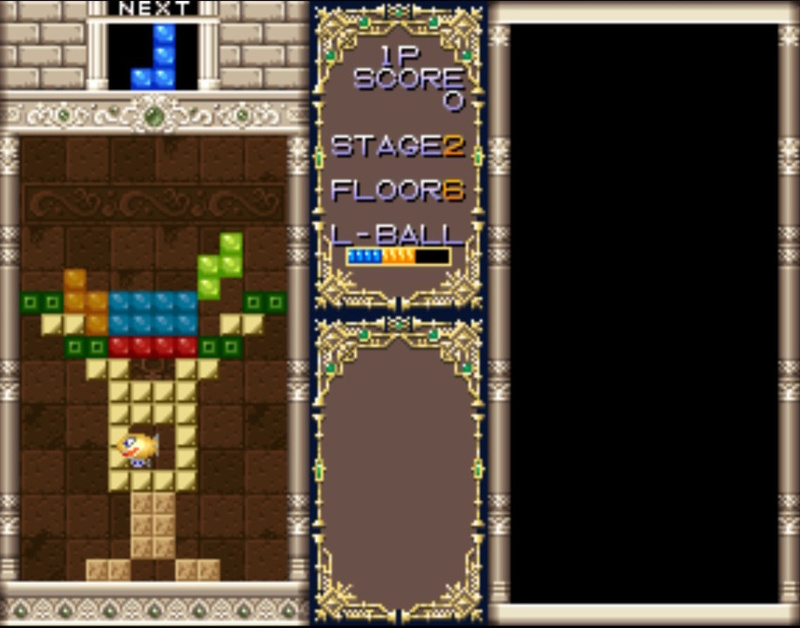 This balloon starts each level surrounded by a bunch of blocks which are preventing it from floating upwards. Until you can free it, they’re stuck there. The aim, then, isn’t just to keep clearing lines as is normally the case in Tetris, but to clear the blocks surrounding the balloon so you can make a big enough gap for it to escape and float up past the top of the screen. The longer you take to do this, the faster the blocks will drop so it’s in your best interests to free the balloon pronto. The problem is, many of the levels have horrendous block layouts that make doing this a massive chore. It’s possible to spend a good 10 minutes on what should be a fairly straightforward level because the blocks are laid out in such a way that it takes you an absolute age to work your way through them. On top of this, the controls are awkward. 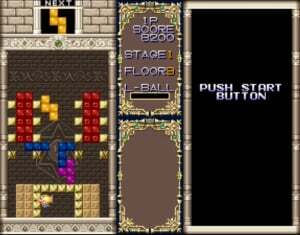 Whereas most good Tetris games and clones have two rotate buttons so you can turn pieces clockwise or anti-clockwise, Puzzled only has a single button: it’s anti-clockwise and that’s that. This makes it far more fiddly than it needs to be, and fitting some blocks in when the speed increases can be massively frustrating, especially given that the game’s controls don’t feel too responsive in general. 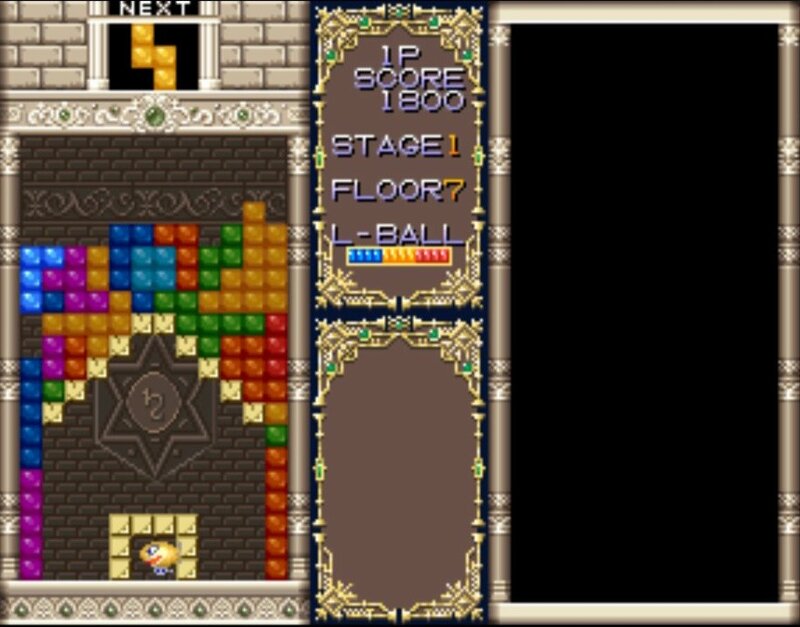 This coupled with the counter-intuitive stage design means players are in for an annoying time, and even Tetris experts can expect to die a lot as they find themselves trying to slog through poorly-arranged block scatterings. 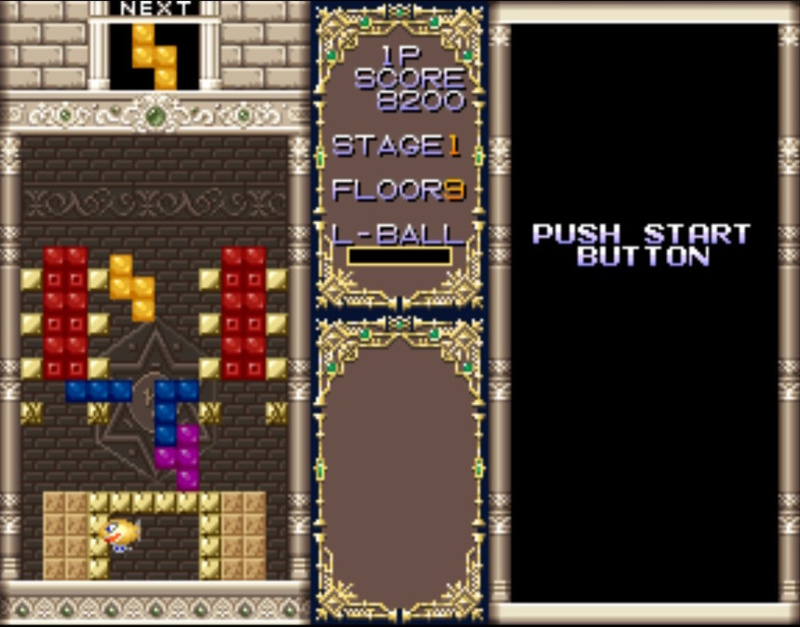 As one of the earliest Neo Geo games, Puzzled is also far and away the most basic-looking offering in the system’s library. Most of Hamster Corporation’s Neo Geo games on Switch at least do a great job of representing the visual glory of arcade gaming during the ‘90s, but if someone was to tell you this this was a Master System game you wouldn’t bat an eyelid: it looks functional enough but makes no attempt to push the boat out, or even raise the anchor. The one main thing going for it is that, as a puzzle game, it’s one of the better fits for the High-Score Mode present in all of Hamster’s Switch conversions. That said, Magical Drop II is a far better Neo Geo puzzler and it’s also available on the Switch, so that should really be your main port of call. At its core, Puzzled is essentially a Tetris knock-off that tries to do something clever with it but in doing so removes what makes Tetris so enjoyable. Its poor stage design leads to some frustrating moments and the more you play it the more each level feels like a chore rather than an exciting step forward. 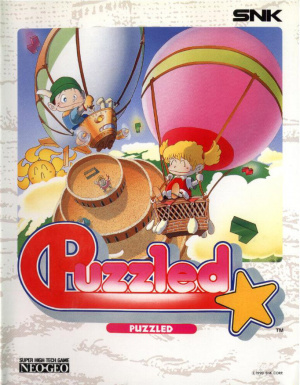 The only thing we’re Puzzled about is why this was chosen for the Switch treatment ahead of far more deserving Neo Geo games. @Yasaal I don't see the problem. If Sony and Microsoft consoles get these games, then why shouldn't Nintendo Switch owners regardless of whether VC exists or not. I'm Puzzled by its score. @Yasaal A pathetic excuse for no VC? Nintendo have nothing to do with these releases; they're not "filling in" for anything. Without Hamster's support, the wait for the VC would be even worse! These Neo Geo releases are way better then Wii U's VC which was full of questionable choices. That some people choose to be ignorant and only want to see those games they have actual childhood nostalgia for instead of the objectively superior Neo Geo games is sad and irritating. It looks like this game isn't particularly good (and we already have Puyo Puyo Tetris anyway), but i'm generally very happy with Hamster's Neo Geo Arcade Archives service. @Damo @Yasaal agreed, nothing wrong at all with the approach. These are released elsewhere and are not part of the VC plus some of the quality on show more than justifies their presence. However on another note, NINTENDO, PLEASE GIVE US A £€&##/@ CLUE ON VC. I'm kind of nervous as to how they'll handle it but quietly confident that we'll get some decent GC stuff. Ouch,I'm glad I never bought this last week.I came close but bought Magical Drop 2 instead.I'm pretty sure Tetris Party Wii had a bonus mode similar to this game's main mode. As for the amount of Neo Geo releases we're getting,no complaints from me,keep them coming.I plan to buy every single one that is worth playing.Very few of us who comment here have ever owned or even played these game's outside the arcades or the ones that made it to Wii VC.I'd much rather buy retro classics I've never played before than buy and play the same old Nintendo classics for the umpteenth time. In my opinion Hamster have set the standard for what VC releases should look like.Perfect emulation,multiple options,English and Japanese versions,High Score mode and Caravan mode.All they're missing is online play. @Yasaal. I don't know what you're whining about. These Neo Geo games have also been coming to PS4 and XB1 every single week. Why shouldn't Switch owners have them too? And many of these Neo Geo games are excellent. Too bad you haven't paid attention. I check the Arcade Archives Wikipedia page every few days to see if any new games have been added.It's been a great source for me in the past.Last week when I checked,Puzzle Bobble was on the list and and was coming to Switch at a TBD date.I checked again a few days later though and it had been removed. I'm puzzled in why this game was given a low score? The closest you can get is Pokémon Puzzle League on the Wii / Wii U. I would recommend the Nintendo DS version. C'mon NL, 3/10 is RCMADIAX territory. I think Chris is just bad at these types of games. Erm...are you sure taking a while to work something out is a detriment to a puzzle game? 3 seems a tad harsh. @Yasaal If you have any ACA NEOGEO complaints, forward them to HAMSTER (not Nintendo). I'm sure they're not going to listen. from Bing translation: "ACEA CA NEOGEO" series started in Nintendo Switch! This will release one after another. these Neo Geo titles are nothing to do with Nintendos VC service so I have no issues in them releasing them. the more choice the better! and agree I have never played many neo geo games so I love having the option to pick up a game that used to cost £100's for just £6.29! keep them coming!! Too many great Neo Geo games are still not yet available on the Switch. They can't stop now. I should have waited for a review before buying this game. I agree its not good. The controls are slow too! @Yasaal @Damo I welcome these classics, especially since it was part of the original VC service on Wii. Not interested in this particular game but I literally bought the Switch as soon as I did just to support the NEO GEO releases on it. @LemonSlice To be fair, I'm currently 15th in the Twin Galaxies world leaderboard for the Game Boy version of Tetris, so I promise I'm not "just bad at these types of games"
It just plays a rubbish version of Tetris and mixes that with horrible stage design. It's all about opinions at the end of the day! @scully1888 Ooops, I retract my comment, as well as bow to you and hang my head in shame in a single motion. @scully1888 You're calling me daft? I retract my retraction, you can't play Tetris to save your life! @Damo Honestly speaking a few titles we're good enough, but the way NEOGEO titles are being increased and shoved down our throats makes it feel as if Nintendo is just gonna ride on the support of these titles. We need VC, not NEOGEO. 2-3 titles we're more than enough (especially seeing the point that the first few titles we're great) but now they're just being Atari with the quantity over quality. I'm not saying I wanna play Super Mario Bros for the thousandth time but it'd be great to at least have some closure on when we'll be getting VC. Or are we getting it. @Yasaal You REALLY need to play more Neo Geo games. Seriously. One day - two switch puzzle game reviews! I have finished all 204 Levels of the Boost Beast today. I completely agree with the verdict (luck, free-to-play origins). But I totally don't understand how a much more skill based puzzle game like Puzzled got degraded. I played the Japanese Version of the Game (Joy Joy Kid) on the Wii VC with the Hori Arcade Stick. It's a evening of hard work, but it's skill not luck! In my opinion this time the review score shows how familiar a reviewer is with the genre (not Tetris only), then the quality of the game itself. Tetris Attack had better modes. ... If anything NintendoLife rated this garbage game way to high.